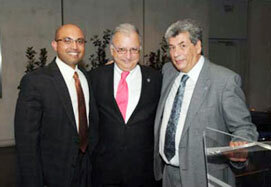 The 28th Politzer Society Meeting in Athens was a success. The four day scientific program began on 28th of September, Wednesday. The mini seminars and keynote lectures took place in five parallel rooms and displayed early in the morning and following lunches every day. Biofilms in temporal bone infections, microanatomy of cochlea for cochlear implantation, otitis media in pediatric population, hearing presentation in partial deafness, bone anchored hearing aids, totally implantable hearing devices, hair cell regeneration, interventional radiology for skull base lesions, dizziness in the elderly people; auditory neuropathies were among the topics presented during these sessions. 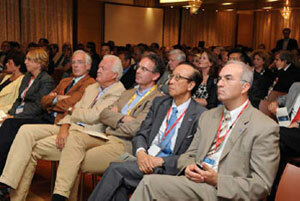 Round tables discussions gathered many prominent otologists of the world to update otology in Politzer Society Meeting. Eight round table discussions and two plenary sessions took place every day during the meeting. Dr. Abraham Jacob, the author of "AR42: A Novel Histone Deacelylase Inhibitor with High Clinical-Translational Potential as Treatment for NF2-Associated Tumors" During the first day of the meeting, Surgical challenges in conductive hearing loss, Fluctuating and progressive SNHL in adults and children, Surgical Management of OME, Acute facial nerve palsy, Outcome of otitis media with effusion, Management of complications of mastoid surgery, Middle ear mechanics and Hearing loss in children were the core topics of round table discussions. Middle ear endoscopy has been revised within the plenary session. The members of Clinical Otologic Research Team (CORT) from US displayed an outlook to the future within the second plenary session of the day. The Round Table discussions were focused on Middle ear atelectasis and retraction pockets, Middle ear and mastoid implants, Classification of cholesteatoma, Cochlear implantation, Otosclerosis, Ear endoscopy and Cartilage Tympanoplasty. Vestibular schwannoma discussion has brought the insights of many experts in the plenary session of the day. Presentation of Politzer Prize papers replaced the plenary session during the second day of the meeting. Five presentations were made basic and clinical sciences each. All selected papers for this final were outstanding and the Prize Jury could hardly select the best among them. "Digital Image Stabilization in the Treatment of Oscillopsia" by David D. Pothier was the winner of the Prize in Clinical Science. "Auditory, Visual, and Audiovisual Speech Perception in CI Users Measured by H152OPET" by HyoâJeong Lee and "AR42: A Novel Histone Deacelylase Inhibitor with High ClinicalâTranslational Potential as Treatment for NF2 Associated Tumors" by Abraham Jacob shared the Prize in Basic Science. On Friday 30th of September, Challenging Otosclerosis cases, Cochlear implantation in difficult cases, Temporal bone malignancies, Mastoid obliteration, Ossicular Reconstruction, Cost benefit of aided hearing, Management of dizzy patients and Brainstem implants were the topics of discussion in Round Tables. Jugulotympanic paragangliomas and Management of the lesions in the only hearing ears were the topics presented in Plenary Sessions. 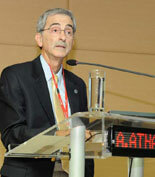 During the last day of the meeting one of the plenary sessions was dedicated to Professor Jan Helms. The other was based on Cholesteatoma. Management of complicated cases of cochlear implantation, Quality of life in vestibular schwannoma, Hearing results of ossiculoplasty, Intracranial complications of skull base surgery, Long term results of cholesteatoma surgery, Dilemmas in otology, Congenital aural atresia and Prevention of failures in otologic surgery were the topics discussed in Round Tables. The Scientific Program was one of the best among the previously organized Politzer Society Meetings, but also the Social Program. The Acropolis Museum that is focused on the findings of the archaeological site of the Acropolis of Athens hosted the Gala Dinner of the Meeting. The participants of the meeting had the opportunity of visiting the museum that was built to house every artifact found on the rock and on its feet, from the Greek Bronze Age to Roman and Byzantine Greece, with the guides before the dinner. 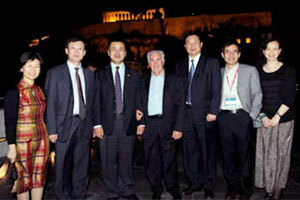 The meeting ended with the presentation of coming International Conferences; Politzer 2013 Antalya, Cholesteatoma 2012 Nagasaki and IFOS 2013 Seoul. 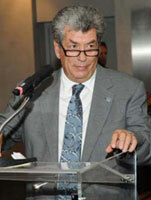 The Politzer Society Board of Directors appreciates the efforts made by Dr. Xenelis for the 28th Meeting. Thank you John.